For many people of faith, God is a mystery, a divine longing, a sacred path that must be traveled with all of one's heart and mind. To deny God is damnation. For most serious painters, musicians and writers, the very same things can be said of their art. To those who possess the drive to create, the compulsion is every bit as mysterious, every bit as "divine," as the ancient traditions and sense of community that sustain the faithful and bring meaning to their lives. In the case of the painter-prodigy protagonist of Chaim Potok's beloved novel My Name Is Asher Lev, both God and art have claimed his soul. For many artists, this would be ideal, but for a great number of Hassidic Jews, the pursuit of God and art is not merely impossible, it is dangerous. In Aaron Posner's sensitive stage adaptation of the novel, now playing in an already extended run at the Marin Theatre Company, Asher (Peter Stadlen) sets up the central conflict of the play with grippingly succinct opening monologue: "My name is Asher Lev. The Asher Lev. The Asher Lev who painted the Brooklyn Crucifixions. Observant Jews do not paint crucifixions. Observant Jews do not paint at all." Potok himself knew the struggle of art against religion. As a young man, raised within a strict but loving community of "Torah Jews," Potok once pursued the life of a painter, even producing a notably scandalous crucifixion. It was as a writer, though, that Potok would make his name, spinning tale after tale of previously hidden Jewish life, regularly tackling the issues of conflict and faith, personal expression and commitment to community that so defined his own life. In The Chosen, perhaps his best-known book, Potok tells of a Hassidic boy drawn to the secular pursuits of academia and psychology. In Asher Lev, his most personal novel, the struggles are even closer to home. With this new stage adaptation, Posner, who also adapted The Chosen a few years back, puts those struggles front and center, creating a play that is as dramatic, intense and entertaining as it is philosophically rich and crammed with juicy insights. Posner's spare and lovely script is mirrored by Melpomene Katakalos' hypnotically simple set: a few simple wooden beams set at perfectly orchestrated angles, ready to tumble should the center of balance be shifted or shaken. As Asher, Stadlen deftly shifts from a child of four, happily sketching everything he sees around him, to a conflicted teenager, to an up-and-coming young man, the new toast of New York City. With pages and pages of poetic monologue to deliver, Stadlen never falters, at times channeling the distinct charm and wide-eyed vocal clarity of a young Matthew Broderick. Playing all the women, but primarily Asher's mother, Danielle Levin is sensational, giving every line layers of meaning, turning every facial expression into an unguarded confession. Reacting to news that her brother has died, Levin's scream of grief, anger and anguish was so authentic I'm surprised the police didn't immediately raid the theater. Patrick McNulty, playing all of the men in Asher's life, is equally strong, especially as Asher's father, a hard-working man of faith, devoted to spreading the teaching of his community's rabbi. In other hands, Asher's father might have been a simple, strict-minded tyrant, but as played by McNulty, the inherent decency of the man in never lost. In fact, one of the miracles of the play is the way Asher's parents grow in understanding and compassion, even as Asher grows less tolerant and more judgmental of them. The moment where the teenage Asher accuses his father of "aesthetic blindness" is especially wonderful, since we see how blind Asher has become to his parents' desire to truly understand their son. Gorgeously written and strongly acted, My Name Is Asher Lev is a tight, wonderfully complex knot of contradictions, clashes and hard-won compromises—right up to the last line. That line, delivered by Asher as a final summation of who he is, where his art has brought him and the impact his choices have had on his family, is an absolute stunner—lyrical, truthful and devastating. 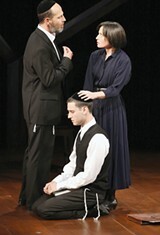 'My Name Is Asher Lev' runs Tuesday&–Sunday through Oct. 11 at Marin Theatre Company, 397 Miller Ave., Mill Valley. Tuesday and Thursday&–Saturday at 8pm; Wednesday at 7:30pm; Sunday at 2pm and 7pm. Additional matinees Sept. 24 at 1pm and Oct. 3 at 2pm. $31&–$51. 415.388.5208.